It was the mid 60’s…music was dominated by the San Francisco bands and the rock and roll coming from across the ocean. It was a mixture of psychedelic and pop for the most part. In Flint, Michigan in 1965 a young guitarist named Mark Farner was playing with a band called TERRY KNIGHT AND THE PACK, led by a DJ turned musician named Terry Knight. Don Brewer was the drummer for this band that had a few regional hits during their time together. Farner left the band to join a succession of other groups including MOJO AND THE NIGHTWALKERS, THE BOSSMEN (1966), THE PACK (aka The Fabulous Pack) (1967-1968), while Brewer continued on with Terry Knight. In 1969, Farner and Brewer recruited Mel Schacher, a bass player who had been in ? AND THE MYSTERIANS, (they of the 1966 #1 Billboard hit “96 Tears”) to join them in a new band. Terry Knight became the manager of this trio, who saw the popularity of CREAM and decided to put together an American Power Trio. 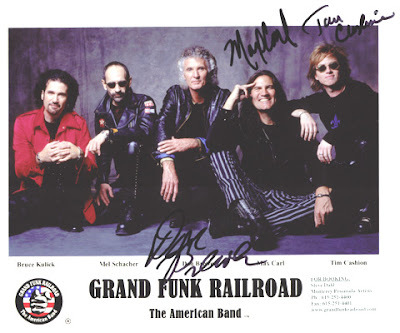 Knight named the band GRAND TRUNK WESTERN RAILROAD, after a well known rail line in Michigan. 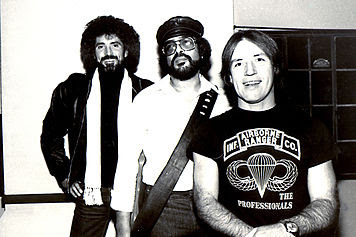 Shortly thereafter the band was ordered to change their name and they became GRAND FUNK RAILROAD. After a successful appearance at the Atlanta Pop Festival, Capitol Records signed the group to a contract. The group began to pump out albums at an astonishing pace with 7 albums released between 1969 and 1973. In 1970, they sold more albums then any other American band. They built an incredible following in a short period of time, but this was only with the fans. The critics hated GFR. Rolling Stone, in particular loved to lambaste the group calling them ‘wretched’. Even Rod Stewart took a swipe at them, calling the bands sound ‘loud, white noise’. This band seemed to lead the way in firsts. They could truly be considered the first band labeled “Heavy Metal”, their manager Terry Knight was one of the original Svengali types in the business, ruling the band with an iron hand and lashing out at the critics who came after the band, especially Rolling Stone magazine. When the critics reigned down harsh words, Knight used them to build an audience for his group. It was quite simple, he called all the critics THE ESTABLISHMENT and the youth of America should embrace the ‘peoples Band’. AND IT WORKED! Hot on the heels of GFR was LED ZEPPELIN, who when they came to the States in 1969 were told if they played their cards right, they just might topple the great GFR! So, why were GFR so popular with the audiences who came out in record-breaking numbers to see this trio? Was it the straight-forward way Farner wrote his music? There were no subtleties to his lyrics, which could explain their attraction to the young rock and roll crowd. They played loud, they even earned the moniker of the ‘loudest rock and roll band in the world’. They didn’t use classical influences like DEEP PURPLE, the ‘satanic-influences’ of BLACK SABBATH, And they certainly did not have the skills of LED ZEPPELIN. They just played loud very simple rock and roll. As the reviewer cited above stated, the musician ship of this band was certainly not to be confused with many other bands of the day, but the record company hardly cared as the money just rolled in. I read somewhere that a good way to describe GFR from a musical proficiency standpoint were they were far south of CREAM way north of the band BLUE CHEER, and from my point of view, that pretty much sums it up. Their first album in 1969 “ON TIME” earned the band a Gold Record. The only real song on the album, in our estimation, worthy of radio play is “Heartbreaker” and that song did not even get the respect it deserved from the stations around the country. 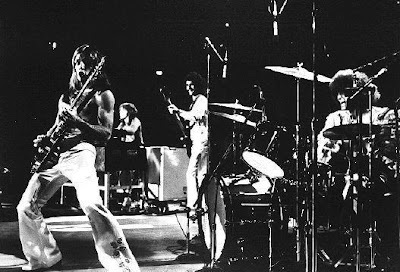 In early 1970, “GRAND FUNK” was released, earning the band their second Gold Record. This album is a perfect example of what we discussed above. Totally unpretentious, a ‘poor man’s LED ZEPPELIN’ is how I remember it being described once upon a time. Did it matter, absolutely not! The fans ate it up (myself included), with “Mr. Limousine Driver”, “Paranoid” and probably the best song on the album “Inside Looking Out” included. The rest of it is very forgettable for so many reasons. Next up was “Closer To Home” in July 1970. On this album the band toned down their style. Terry Knight spent $100,000.00 on a billboard in Times Square to promote this album and it went multi-platinum as the critics continued to trash the band and their sound. The juxtaposition of the reviews against record sales is still, in our mind, one of the more interesting aspects of GFR. 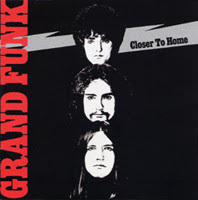 (though the album just says Grand Funk on it). This is the album that contains the songs many people remember to this day; “Mean Mistreater”, “Hooked On Love”, “Aimless Lady” and the runaway hit “I’m Your Captain”. "I'M YOUR CAPTAIN/CLOSER TO MY WORLD"
The band tried to ‘funkify’ their sound, but in the hey-day of Sly and Funkadelic, well; it tended to come off as exactly what it was a white-man’s attempt at that genre. In December of 1970 the band sold out two concerts at Madison Square Garden in less than two hours. At this time, they were not talking to the press at all. Only Terry Knight spoke for the band and this increased the animosity between the press and the group. They also released a live album of their music which truly showed the intensity the band played live. The songs from the studio albums that were mediocre became anthems on this album. They showed the ballsy, angry, metal that was GFR (again, on the album cover the ‘Railroad’ was left off…). In July of 1971 GFR broke the record of the BEATLES selling out two concerts in less than three days (the BEATLES took three weeks to do the same). Around this time is when the title ‘World’s Loudest Band’ was bestowed upon them. The neighbors around Shea Stadium complained bitterly about the ‘noise emanating from the stadium’. 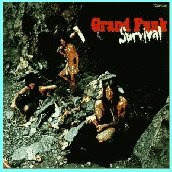 In April 1971 “Survival” was released. Was the album title a reference to the band’s ongoing struggle with the music industry and the critics? The cover art has the three members looking like cavemen surrounded by half eaten bones and meat (the critics, perhaps?). The album contained covers of some of the hot songs of the day including; “Feelin’ Alright”, the TRAFFIC hit, “and “Gimme Shelter”, from the ROLLING STONES. This was an abysmal album in our estimation. “E Pluibus Funk” followed in November 1971 as the band continued its prolific recording sessions. This album showed the band in a much better light than their last effort and contained the rousing “Foot Stompin’ Music”. 1972 was a year of change for the band. First they fired Terry Knight, which plunged them into a long legal battle with their former manager. They also decided to add another member and after Peter Frampton turned them down, they reached into their past and brought on keyboardist Craig Frost, who they knew from their days in THE PACK. This gave them a little more R&B feel to their music and though it turned off part of their fan base, the band continued on releasing their sixth album “Phoenix”. In 1973, the band hired the brilliant Todd Rundgren to produce their next album “We’re An American Band”, in July of that year, with the title song becoming a mini-anthem for the group from that moment on. Rundgren also produced the March 1974 album “Shinin’ On”…which contained the Little Eva hit, “The Loco-motion”. In December of that same year, they changed producers to Jimmy Ienner and released “All The Girls In The World Beware”, which gave us “Some Kind Of Wonderful”. But stress within the band began to show. A major tour, which resulted in “Caught In The Act” followed in August of 1975. The band went into the studio planning to record their last album “ Born To Die”, which was released in January of 1976. Then Frank Zappa stepped into the picture as producer of “Good Singin’ Good Playin’” , not much of which appeared on this album that felt more like an opportunity to turn a quick buck...Zappa was also featured on the album cover…now think about it, when is the producer shown on the cover with the band? After this album, the band went their separate ways with Farner beginning a solo career and the other members forming FLINT along with Billy Ellworthy. The band then began a back and forth with a reunion in 1980 as Dennis Bellinger replaced Schacher on bass guitar. They released two albums that few even know exist to this day and then disbanded again. Farner went solo again and began a career playing Christian music, while Brewer and Frost joined Bob Segar’s SILVER BULLET BAND. Another reunion in 1996 (with Schacher) found the band playing 14 shows in thee months. The next year, the band did three concerts in support of Bosnia with a full symphony orchestra, selling them all out, and resulting in a two disc benefit CD “Bosnia”. The man they once tried to recruit Peter Frampton appeared on the CD. Farner then left the band for good to resume his solo career. In 2000, Brewer and Schacher recruited .38 SPECIAL lead singer Max Carl, former KISS guitarist Bruce Kelick and keyboardist Timothy Cashion and went out on tour as GRAND FUNK RAILROAD. The band continues to tour to this day and will be playing here in Memphis at the DELTA FAIR AND MUCIC FESTIVAL on September 8th. An American Band? A mishmash of music by sub-par musicians? The original Metal band? All of the above? We guess it depends upon your ear and point of view. We certainly have enjoyed their music, while realizing that there was more filler on their albums then most. Whatever your opinion, you can not deny that this band packed them in wherever they went and certainly have a place in Rock and Roll history. 1974 "Some Kind of Wonderful" #3 - All the Girls in the World Beware!!! 1975 "Bad Time" #4 - All the Girls in the World Beware!!! Wow! I am most smitten by your details and tune selection! Especially "I'm Your Captain"...I love that song! It's former KISS guitarist Bruce Kulick...not Bruce Kelick. Oh my--how long did this take you? I love Rod Stewart's quote LOL--meeeoww. when I was younger, I always thought GFR was a country band, or some sort of joke. College and the stoners in my dorm changed my opinion. 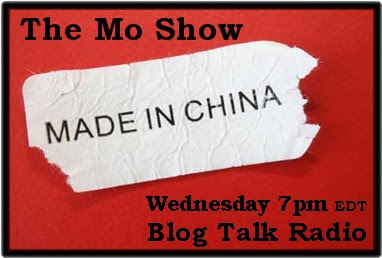 see ya' (hear ya') at the mo show honey! They are such a quintessential 70's band. To my mind though Sabbath will always be the first metal band. And share the statanic weatlh...Jimmy was a bit "off" in that area as well! You will always be a standup duck Sir. I was just a baby back then....but remember GFR. I love learning little tidbits to file away for future use. Only you could pull this one off my friend... No matter what people may think of that group, they made an impression and left their mark. Rabid fans while critics scorn... why does that sound familiar? Yeah, the Grand Funk story is always interesting, the Terry Knight years, and then the 1972-76 classic quartet (the real GFR to me). The album they did with Frank Zappa, they actually had a 3 album deal with MCA, but only did one, anyway, to me it's a weird LP, it seems it's either thought of as their best, or, just divided opinion. I have a '76 Circus Magazine with an article on the recording of the LP (they apparently broke up during making the LP, got back together!). It helped me to appreciate the record more, and Zappa seemed to love it. If anything, Zappa plays some great guitar lead on it. Also, Zappa's pic was only featured in the advertising, not on the LP. Oh, the whole what is metal thing is silly. Hendrix played loud, GFR did too. Don Brewer thinks the phrase 'hard rock' fits best.